When I was a young elementary student, one of the presents I received for Christmas was a family tree kit. It came in a green cardboard box, filled with a large poster of a fillable family tree and a bound notebook of questions to ask your family. My parents enforced in my brother and me the importance of knowing your family and ancestry. So I whipped out that chart and began filling it out. I knew my parents’ names, birthdays, and birth places and I knew my grandparents’ names and birthdays (but wasn’t sure on the birth years). But then the chart asked for their parents. Their parents? Who would have known that THEY had parents, too!? I began asking and that is when I discovered something: I had an ancestor not born in America, but who was born in Sweden. Whoa. That was a big deal for this second/third grader. 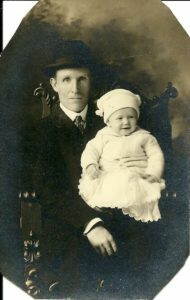 This man was my paternal-paternal great-grandfather, Andrew Peterson. I asked what my dad knew about him. Not much. I would have asked my grandpa, but at that point his Alzheimer’s was worsening. But my grandpa’s brother was the family historian for that generation, so I would ask him. …but then he passed away. My dad knew, however, that my great-uncle kept in contact with his first cousins in Sweden. Uncle Russell also had gone over there to do some genealogical research! We got the address of the woman he was corresponding with and I sent her a postcard. This postcard was top-of-the-line professional (for a third grader): a Bugs Bunny postcard. Using a Swedish-English dictionary we bought at Borders, I wrote who I was and that I wanted to ask her questions. I put the stamp on it and off it went…just to bounce back saying that person was no longer there. 20 years later, I founded my genealogy business. I have accumulated a lot of brick walls since 1995, but Andrew was still one of them. AND as I have discovered while growing up: Peterson is not that uncommon of a name, especially when it comes to Scandinavians in Minnesota. I scoured Ancestry, FamilySearch, MyHeritage, anything I could find that would give me results for Andrew Peterson in St. Paul. But the problem: which one was mine?? Lo and behold I was able to make a breakthrough due to stars aligning. First, I found among my grandparents’ belongings Andrew’s travel diary to America. Not only did Andrew write it in Swedish, but he then translated it into English. I am not sure if it was a writing exercise in his new language OR he was thinking ahead and wanted his descendants to be able to read his journey. And second: the Wisconsin Historical Society was holding a day-long workshop on Swedish genealogy. It was there I learned about the Household Examination Books. These are records that are similar to US Census records, but they give much more detail. Each household has a page (or a half-page, if the family is small enough). They are asking for names, birth dates, occupation, and what they have in their house. If they moved to America or there was another life-changing event, it was noted. These records are now available on FamilySearch AND Ancestry.com. So I wiggled my way a bit farther. And then I got stuck again. The family trees are a tricky spot on Ancestry because humans are adding their own information AND many people just accept what others put online without verifying the information. But I went in to recheck the information and to see what is available. Who else had Andrew on their family tree? I went, and a couple of people did, but I tried something else: I went up a generation. Because I knew where he was from in Sweden (due to the diary) and his father’s name (due to the Household Examination Records), I was able to add with certainty his father’s name: Petter Persson. THAT was the jackpot! I found 8 family trees with Per on it, along with his son Anders. I wrote each of the owners of the family trees. I looked at their activity on Ancestry (most of them daily users) and I saw that half of them lived in America, half lived in Sweden. I have heard back from 3 people so far. One person had Petter on their family tree because he went to the same church has her relatives (…not sure how that works out, but okay). The second one suggested I contact people in Sweden (I did). But the third person has been terrific! She lives in Sweden and she had no idea that we existed; she thought everybody stayed in Sweden. We have traded emails and have been able to find out how we are connected, with Per being our common ancestor. Anders Pettersson was born in Lindesberg, Orebro, Sweden in October 1864. He had 6 siblings. He came to America in March/April 1888 by way of Gotesburg, Sweden through Liverpool, England, arrived at Castle Garden, New York and settled in Minnesota. He worked as a farm laborer in Albert Lea, Minnesota before moving to Minneapolis and then St. Paul in the late 1800s where he worked for the Minnesota Railroad Transfer for the remainder of his life. It said that Anders’ destination was St. Paul, Minnesota. He traveled with four other people from his hometown and about the same age (all within a 10-year span). Writing back and forth with my Swedish cousin, she discovered that a handful of Anders’ cousins also went to America. She gave me names and birth years. One of the people that she had on her cousins list was a man he traveled to America with: Anders Larsson. A question that we won’t be able to answer is why in the world he did he not name his cousin in his travel diary? Again, looking for Larssons in Minnesota is just asking for a headache. But I tried. Using his name (and the Americanized version Andrew Larson), his birth year, and Minnesota, I found a few that could work. The one that does stand out, however, is an Anders Larsson who worked for the railroad. Needing to find more evidence to connect the two Anderses, this gives me a hopeful lead. But who encouraged who to come to America? To Minnesota? Again, a question that we will not be able to answer. Like I have told people who attend my presentations: we are each other’s best resources. Conversations help solve century-old problems, giving light into resources and basements from across the world. Ancestry.com and other genealogical resources can help take us a long way, but they cannot take us all the way.